Welcome to a place designed to embrace the striking brilliance of a natural landscape. 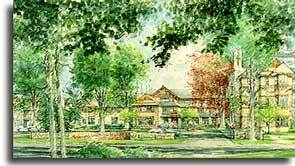 Unlike other senior living communities in Connecticut, Edgehill is rich in history and tradition — where first-class services and amenities present countless opportunities, where protection for tomorrow means getting the most out of each day, and where unique individuals become a true community. Located in Connecticut on the Stamford/Greenwich border, Edgehill will exceed all your expectations about what you think a retirement community should be. Everything you need for the senior living lifestyle you've imagined is at your fingertips: a neighborhood setting, excellent services and amenities, and the Lifecare Advantage, offering independent living residents priority access to a full continuum of on-site care, including Assisted Living and Skilled Nursing Care. The best New York and Connecticut shopping, dining and cultural attractions are only a short trip away — Edgehill is near major highways and the Metro North train system.